Friday, May 31 from 9:00 a.m. to 7:00 p.m.
Saturday, June 1 from 9:00 a.m. to 5:00 p.m.
An Entrance fee of $4 for each quilt being judged. 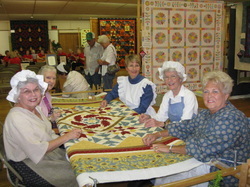 RAFFLE QUILT - We will be featuring a Raffle Quilt this year with the Drawing to be held on Saturday , June 1 at 4:45 pm. Brown County Pioneer Women’s Club 2019 donation quilt is a Trippel Irish Chain made with 57, primarily Kaffe Fassett, fabrics. It measures 88 by 110 inches, This is an extra long queen in order to cover pillows. All fabrics were washed, dried and pressed prior to construction by Suzy Zody. This quilt was quilted by Carolyn Messer of In Stitches Quilt Shop in Rushville, Indiana.